North Beach Sea Glass at Port Townsend, Washington, USA. In 2009: "Lin and I drove down Whidbey Island, hopped the ferry to Pt. Townsend on foot, and caught the bus in Port Townsend to North Beach. "Above is what we got in about 4 hours! "Wow, we wish we could get over there more often..."
UPDATE - February 2012 to August 2013, Lin and I (David) lived in the Sequim/Port Angeles area, about 40 minutes from North Beach. We have been to North Beach many times, all with good success. If you get a chance, pick up a copy of Afoot & Afloat North Puget Sound . This book is a must-have for sea glass lovers hunting for treasures in the beautiful Puget Sound area. Lin and I own a copy and it has details of how to get to just about every accessible beach, cove, boat ramp, etc. Even better, it goes into the history of the particular beaches. For example, the closest beach to our temporary quarters here in Sequim, WA, is a beach called Port Williams. We wondered why in the world it is called a "port." All there is now is a boat ramp and a tiny county park surrounded by woods and fields. In detail, this book tells us that it once was the stop along a steamer route and had a post office, dance hall, restaurant, and residences. Now there isn't even a portapottie that we could find. But you can imagine the possibilities of old glass on the beaches described in this book - and other books of this series. *Although it doesn't include a map to North Beach itself, it does talk about it and gives some historical color (Indians) to this beach. N.Beach is basically right where the picnic area is and the boat ramp area. Walk a little either direction. The community of N.Beach is all the homes in the surrounding area. Not real big. It's not as far as Glass Beach though. Not even close. The whole area outside of town is referred to as the county. For your complete report on North Beach, Washington, including Glass Beach, sign up for our occasional newsletter (also completely free). 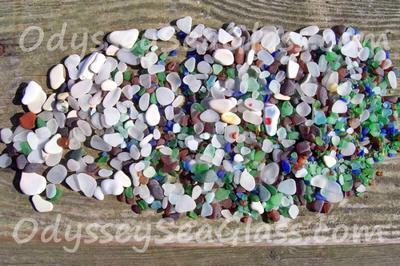 Sign up now and get a FREE SPECIAL Sea Glass Beach Report! Anne - Great rundown on the ins and outs of the North Beach area. Most people we see in the winter are walking their dogs - and after about 50 yards, thin down quite rapidly. Murray - I don't think there is a marble in the photo. You may be looking at an agate that is very round and smooth and caramel colored. It is about 1/2 the size of a marble. There are quite a few pottery shards, white included. A great beach! To be precise, North Beach is a park maintained by the county and bordered by Fort Worden on the east. It includes the now-closed boat ramp. So North Beach Park is really quite small, perhaps 50 yards to the west of the boat ramp; although that is a guess. There is no line marking where the park ends. References to north beach could refer to as far as a mile or two to the west, perhaps a third the distance to Discovery Bay. Does anyone else have any ideas about where "North Beach" ends? I have a question...what is the difference between North Beach and Glass Beach? Anyone heading to North Beach in 2010 has a real adventure ahead of them. It is a fantastic place to walk, explore at low tide, and, of course, search for sea glass. Baseball and Football- sized rocks that is. The storms this season left some formerly pebble/sand beach areas covered with several feet of these ankle twisting rocks. This is not a beach for flip flops or casually constructed sandals. Do yourself a favor and go for sturdy and supportive footwear this year. Seriously. I have helped more limping flip floppers back to the main drag than I care to think about right now. Don't ruin a great day for yourself! Hundreds- of people that is. The last few weekends have been cold, windy and rain soaked. But each day (I walk out there with my dog) I counted more than a hundred people with heads bent over and plastic bags clutched tight. We usually see more than 40 on a weekday in the morning, 30 or more late afternoons. The great thing is that everyone can find a little something if you really look, even after the hundreds of visitors over the weekend. The pieces are smallish, but lovely. And this is within 50 yards of the parking lot. Look up- This is a beautiful part of the country. Don't spend so much time looking down that you miss the raw beauty around you. Time it- Tides are unforgiving on this beach, and all of the staircases along the walk are privately owned. Most are gated and locked at the bottom, when there are any at all. Watch that tide. Be nice. I love talking to so many of the collectors out there. Half the fun is showing off your favorite piece, or comparing ziploc bags full of treasure. If you want solitude, fine, but remember that this is a public beach. Today I saw people yell at some kids for playing around the tide pools near where the group was searching. Don't lie, don't yell, and try to be human. This is a fun thing to do! Join in and write your own page! It's easy to do. How? Simply click here to return to Photos Catch of the Day.